Undoubtedly, unless you’ve been living under a rock, if you regularly read nibletz.com, than you’ve heard of 500 startups, startup, Markerly. The Washington DC startup is in the latest batch of companies being accelerated at 500startups in Mountain View. 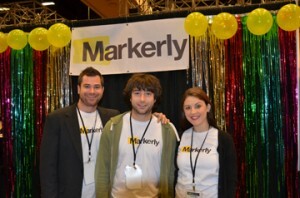 Markerly makes easy to use, but robustly analytical publisher tools. Their tools don’t require a widget, great publishers can just insert one snippet of code and do things like share bits and pieces of content across social networks or comment on photos. The best part is that Markerly is free. Nibletz.com, the voice of startups everywhere else, was the first blog to use Markerly’s tools and we’ve been the beta testing guinea pig throughout their entire experience at 500 startups. Recently they added the voice of Silicon Valley, PandoDaily as well. The company was founder by Sarah Ware. The New Jersey native, Georgetown graduate and former employee at hot DC startup, LivingSocial, and longtime friend Justin Kline started Markerly as a way to share highlighted content. Since arriving at 500startups the team has found more refined ways to share. They also provide sharing analytics which can be invaluable to a founder.